Toy Jaguars based on the D-Types of the 1950s. 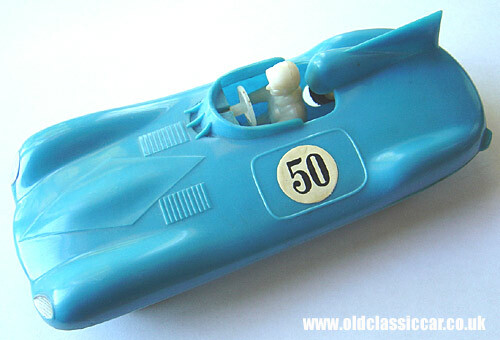 Four toy cars are shown on this page, all inspired by the streamlined D-Type Jaguar sports racer of the 1950s. Although all looking identical bar colour and stickers, they are in fact two pairs of toys. The first two have no manufacturers' mark underneath, just a code of 113 and the usual Made in Hong Kong printed on the base. 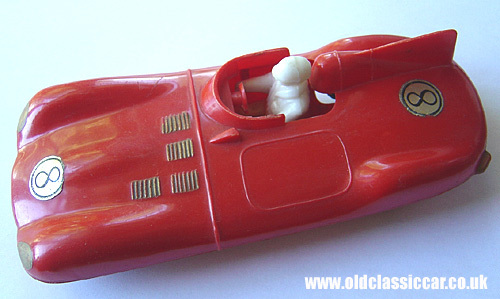 These two toy cars feature friction drive but more basic detail than the other two (eg moulded-in steering wheel rather than a seperate piece). 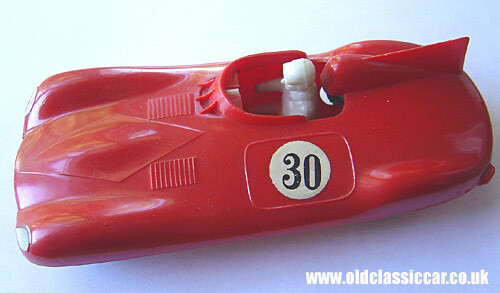 The other two cars are ever so slightly longer, but also feature a friction drive mechanism to the front wheels. These two, numbered 30 and 50, were made by Hoda ("No.102"), again of Hong Kong. They are also noticeably heavier than the other two. All are approximately 7" in length.